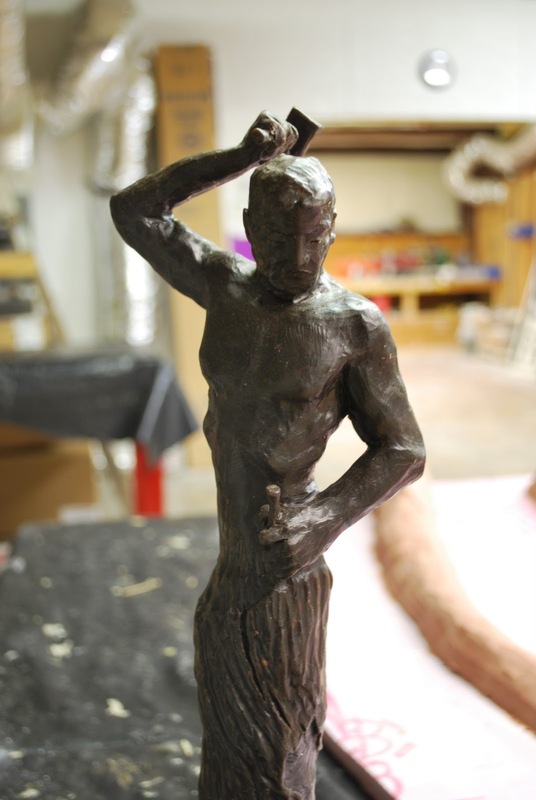 After the drawings were approved I had models pose in the right positions for the Regenesis sculpture. 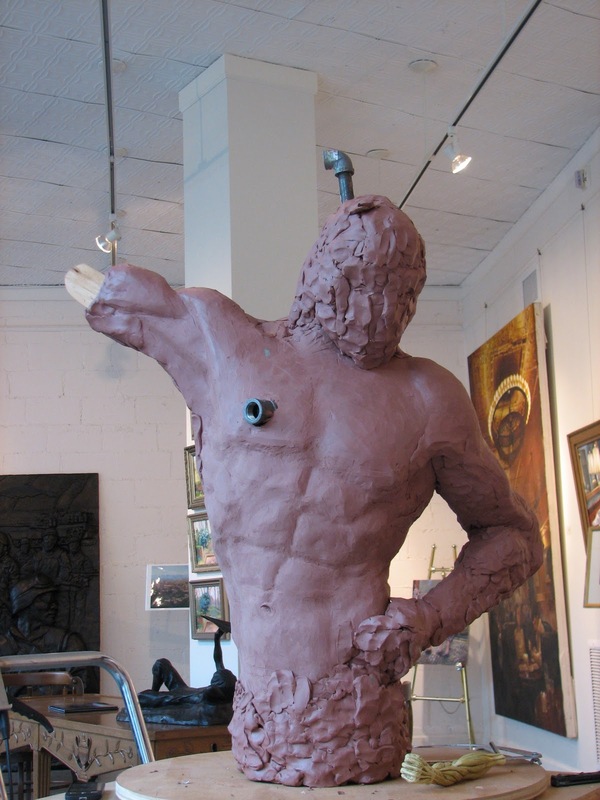 I first created a maquette. 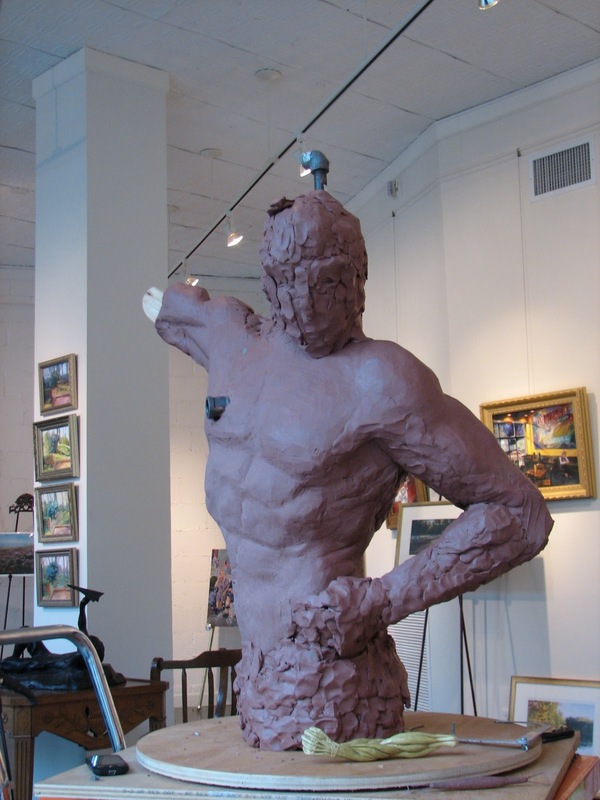 The 13″ version of my sculpture was made of wax. The wax is much better than clay for tiny detail. However, working with wax is a slower more tedious process. 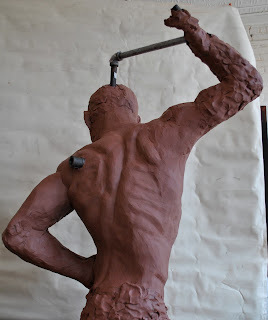 Once I felt comfortable with the look of the maquette I began work on the full sized piece. These images show the armature, made of wood and piping. I also stuff the figure with news paper and pink insulation foam. 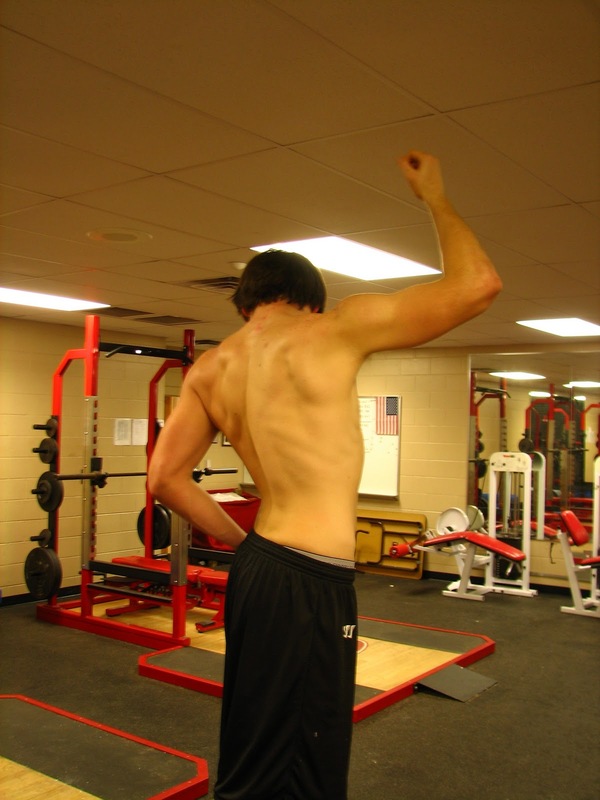 This helps build size without adding a lot of extra weight. After hours and hours of mushing and carving the clay, he starts to take form. I invited people to come by the gallery and look at the Regenesis project as I worked. The most common question that I was asked was about the exposed pipes. 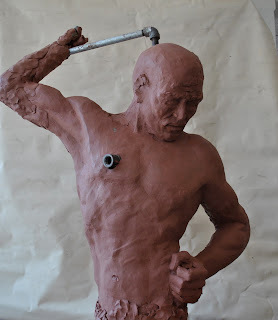 The pipe that connects the head and the arm is simply there as reinforcement for the weight of the clay on his arm. The clay is not strong enough to support itself. 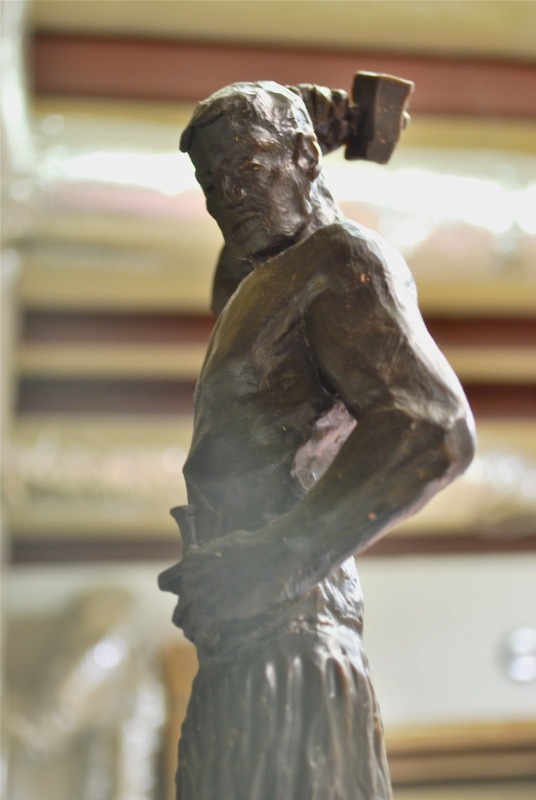 The pipe in his chest is used when moving the work. 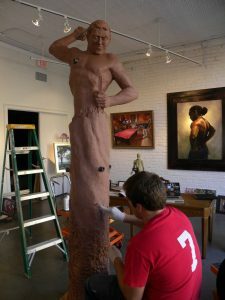 I had to transport the figure and move him around the studio, but I did not want to lift him by grabbing his arms or head. So I included, in the armature, a pipe going straight through his chest that additional pipe could be added on to. That way he could be lifted with all of the weight transferred to the metal armature. None of the pipes will be included in the bronze version. To create the face I combined portions of the model’s face and my own. 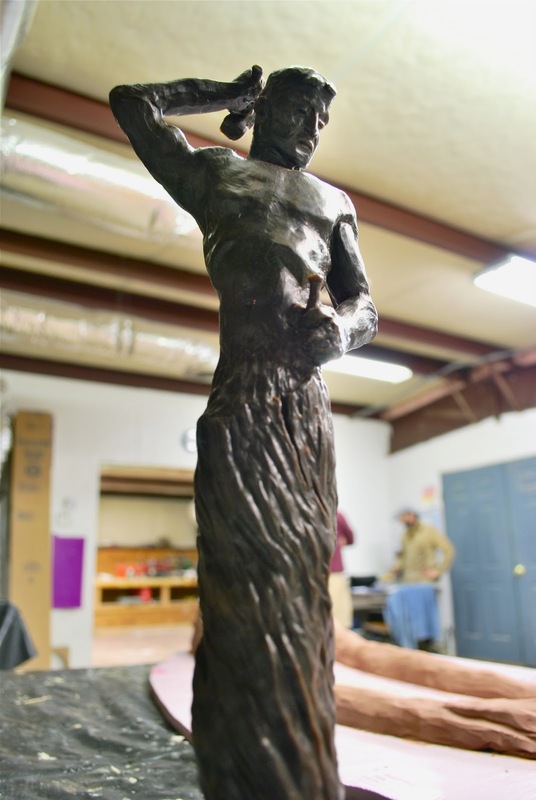 After I finished the bark texture on the tree portion of the sculpture, he was ready to be cast and bronzed. 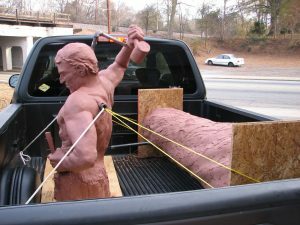 So I loaded the work in the back of my truck, tied him down as securely as possible, and headed for the foundry in Atlanta.